Pyxis Hostel offers an equipped kitchen, gas oven, electric oven, microwave, refrigerator, pots, pans, dishes, glasses, and cutlery. You have lockers and a rest area next to the kitchen. You can buy your padlock in our bar at an affordable price along with other facilities (personal hygiene items - towel rental). Luggage storage free! In case, you check out, but you stay a little more in the city and in our facilities. We invite you to know our internal courtyard, where you can relax and if you are a smoker, take advantage of this space to do so. 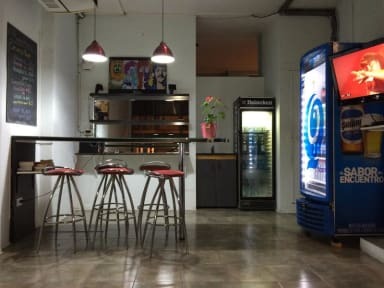 In our lobby, you have tables for your comfort, sofa, puff, and television with cable and prepare to enjoy our bar, where you will find national beers, soft drinks and other spirits ideal to make the night before the porteña! Finally and very important, you have high speed WIFI throughout Pyxis! We are in Palermo, strategically located for your stay to be the best, close to green spaces such as the Palermo Forests, Botanical Garden, Floralis, Planetarium, 4 blocks from the Malba and Recoleta Museum and Center Salguero Complex! Is a quiet area that despite having, an important avenue close at night is a quiet environment and we are half block from the Hospital Fernandez. You will find a few meters of shops, bars and typical restaurants with many bus lines and subway (Metro), so you can reach all points of the city including Jorge Newbery airport, which takes you to 20 minutes . In addition we help you to know the city with the best city, free and paid tours, walks, bicycle rentals, restaurants, tango events and much more so that you live the city of the fury! We offer comfortable shared and private rooms. Private bathroom in PB, spacious, with facilities for people with motor disabilities, refrigerator, air conditioning, heating, window to internal courtyard. Room to share 4 people mixed with bathroom to share. It has two bunk beds, two bed tables, wardrobe / closet in wide wall, shelf, window to street, located on the 2nd floor, access by stairs. Shared room of 6 people only female with bathroom to share. Has three bunk beds, bedside tables, air / central heating, large window to the street, located on the first floor. Access by stairs. Shared room of 6 people mixed with bathroom to share. It has three bunk beds, bedside tables, and lockers available inside the room, air and heating, window to the street, located on the third floor, access by stairs. Shared room of 8 people mixed with bathroom to share. It has 4 bunk-style beds, wardrobes available, bedside tables, air and central heating, large window to the street. Located on first floor, stairs access.